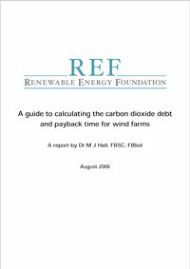 Wind turbines do not emit CO2 at the point of generation but, in common with all generation modes, emit it during construction and, through damage to the site, over a much longer period. The carbon debt varies widely from site to site and comprises emissions arising from fabrication, from construction (including transportation), from the indirect loss of fixation by plants lost to construction and, lastly, from the long-term release of CO2 from carbon stored in peat as it dries out after construction. Peat is a major carbon sink due to dead plant remains accumulated over millennia and held in perpetuity because the bog’s wet, acid conditions prevent the access of oxygen and inhibit the bacteria which would otherwise rot the vegetation. Draining peat for construction reverses these long-term processes: the soil is exposed to the air, the carbon is converted to CO2 and released slowly to atmosphere.